When the World Trade Center’s Twin Towers collapsed into a heap of rubble and ash, the United States government created the Department of Homeland Security. Its primary task is to keep the terrorist threat in permanent view. To do this, it developed a five-stage warning system based on the colors green, blue, yellow, orange, and red: 5 codes. The hypnotic character of this system prompted the editors of this book to conceive a history of architecture based on these 5 codes. When the World Trade Center’s Twin Towers collapsed into a heap of rubble and ash, the United States government created the Department of Homeland Security. Its primary task is to keep the terrorist threat in permanent view. To do this, it developed a five-stage warning system based on the colors green, blue, yellow, orange, and red: 5 codes. 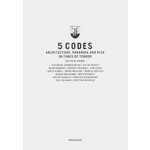 The hypnotic character of this system prompted the editors of this book to conceive a history of architecture based on these 5 codes. For the fifth anniversary of September 11, the book gazes spellbound into the abyss of the indissoluble entanglements and connections between culture and fear, which determine our lives more than ever today. Urban and regional planning, urbanism, and architecture are more and more powerfully marked by this culture of fear throughout the world. 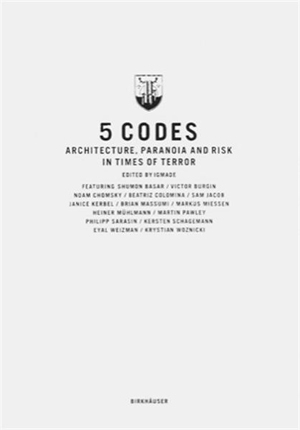 With a fascinating collection of texts by noted authors and spectacular architectural projects, 5 Codes presents a vivid and informative account of the light and shadow sides of our collective paranoia.